It was a rainy Sunday afternoon in early April when we called “Brigadier General” Sultani Makenga, the military leader of M23, currently one of the strongest armed groups in eastern Congo. Working as field researchers in the Kivus, we wanted to engage with him face-to-face to capture his take on the DR Congo’s state of affairs and learn first-hand about the latest developments inside the rebellion. M23 was consumed by heavy infighting in recent weeks, after latent fractions and fissures between Makenga and his rival Bosco Ntaganda erupted into open and violent conflict. In the ensuing whirlwind of events, Makenga regained the upper hand in late March, and Ntaganda surrendered to the International Criminal Court, leaving many of his men with no choice but to re-defect. The initial telephone conversation was an unanticipated success. With little hesitation, Makenga agreed to meet us. The ensuing organizational logistics were simple and matter of fact, conducted via text message informing us of his whereabouts north of the provincial capital of Goma. As an individual sanctioned by the United Nations and the United States government, he remained relatively unconcerned and non-clandestine about his location. Accessing rebel-controlled territory requires preparation. This area had experienced high levels of violent conflict in previous weeks. After interviewing several drivers, we hired an experienced fixer with his own car. Colleagues and security experts consented to our plan. Easter Monday we set off. A barricade at the northern outskirts of Goma, two kilometers past the airport, was the last demonstration of Congolese state authority before entering M23-held territory — a dozen uniformed men and a thick wooden stick placed across the road. It is symptomatic of the feeble protection that has come to characterize the army’s performance in the country’s main eastern city. The few state officials that are stationed at the frontlines may offer little resistance if M23 were to decide to retake Goma as they did in November 2012, with the alleged support of Rwanda and Uganda. As we approached the roadblock, the driver gave us a run-down for easily getting through the barrier. In an extended back-and-forth, he pretended we were tourists eager to explore the nearby volcano that had engulfed the city in lava in 2002. Shortly past the barricade four UN peacekeeping tanks stationed at the side of the road — heavily armed and well protected but venturing little into M23-held territory. They smiled awkwardly and waved us through. Traffic on the bumpy road was relatively busy in both directions, in stark contrast to a trip to Rutshuru taken in early March, when the population was fleeing toward Goma, balancing what belongings they could carry on their heads. The road was largely absent of M23 soldiers. Along the way we passed small bands of rebels, some wearing their old Congolese army uniforms. Apart from surprised and sometimes confused looks, they paid very little attention to our passage. The surrounding scenery is very beautiful. Encircled by towering hills and volcanoes, the road led us through lush green pastures. Despite the tragedy associated with the Kivus, nature’s charm in this part of the world is captivating and puts in stark contrast the cycles of violence prevalent in the lives of the people who call eastern Congo home. On the ninety-minute drive, we encountered one major security checkpoint in the small town of Kibumba, roughly 30 km north of Goma. Approximately twenty combatants — some of whom carried RPGs, grenades and other assorted heavy arms — forced us to stop and explain ourselves. One M23 member in particular was very agitated and made our driver step out of the car. Leaning through the window, he asked for our identities, professions and the purpose of our trip. We mentioned the “rendezvous avec le général,” allowing us to resume the journey minutes later. Despite the politico-military events in the region, life in the villages goes on. Markets are bustling and villagers go about their daily activities. Life in complex emergency settings does not necessarily take on the chaos described by the media. Life must continue as a set of daily tasks and relationships within communities regardless of the violence surrounding them. The rebels we saw lingered around, chit-chatting and waiting — a rather peaceful situation that might not necessarily be the case at any time. Once in Rumangabo, a rather quiet village, we had to pass an improvised barricade staffed by three M23 men. They used their Motorolas to announce the arrival of “Christoph and Timo.” The “Brigadier General” stays relatively secluded from the village, preferring to remain in the army’s former military base and “centre de brassage.” Overseeing the base, offices and houses for superior officers lie at the top of a hill against the beautiful backdrop of the Rwenzori Mountains. Makenga’s close entourage, approximately 40 men, took guard positions around the buildings. The soldiers paid little attention — seemingly accustomed to the arrival of ‘bazungu,’ the name for white people in Kiswahili, who came to interview their leader. Surprisingly, we were not searched for weapons and only asked in passing to open our bags. The men mandated to protect Makenga hang around the buildings, seemingly unsure of what to do with themselves. A group of men just lay face down on the grass, taking a nap. Others oiled their weapons with torn rugs, smoked, cracked jokes and went about their day. However relaxed, their weapons were always within reach. If not for the guns and uniforms, the young men could have been in any of a thousand villages in the DR Congo. We tried several times to engage the soldiers in conversation, but to no avail. While they readily accepted our cigarettes, they remained taciturn. One soldier in particular seemed to give the others instructions not to talk to us. While our driver stayed behind, we followed a civilian toward a stone platform on top of the hill, where they had already placed four plastic seats and a table. We stood by, stiff with apprehension. It took Makenga approximately 15 minutes to arrive after his men seemingly concluded that we posed no threat to him. He wore civilian clothes — black jeans, black shirt and a black jacket — and his emblematic cap. “Bonjour, Général, ça va?” After a few minutes of small talk, we got down to business. Born on December 25, 1973, in eastern Congo, Nziramakenga Ruzandiza Emmanuel Sultan aka Sultani Makenga belongs to the Mugogwe sub-ethnic group of the Tutsi community. With his family originating from eastern Masisi, he grew up in Rutshuru territory just north of Goma. In the early 1990s, he joined the Rwandan Patriotic Front to fight the then Hutu-controlled government in neighboring Rwanda. 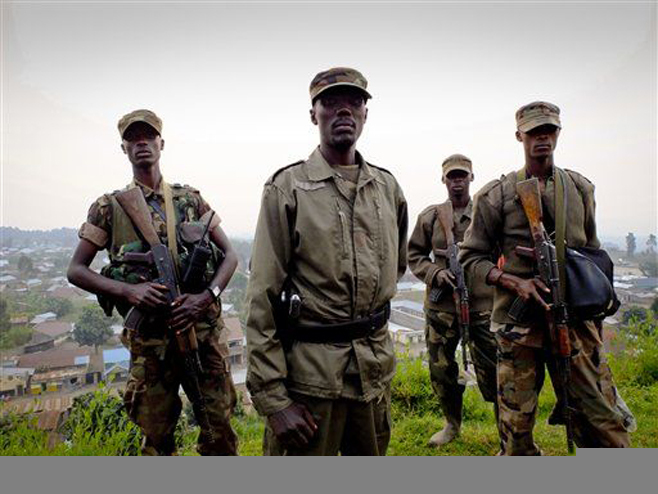 Alternating between the Rwandan and Congolese army as well as several non-state armed groups (RCD-Goma, CNDP, M23), Makenga has spent his entire adult life as a military figure. He eventually acquired various grades, promoted to “Colonel” in the army and “Brigadier General” in M23. With few years of formal schooling, Makenga proved to be rather successful in striking alliances and gaining the trust from influential players in the region. Albeit awkward, the one-on-one interviews were rather relaxed given that Makenga is accused by the United Nations of “killing and maiming, sexual violence, abduction and forced displacement” of civilians in eastern Congo. In the little time we spent with him, we encountered a man starkly different from his public persona. His has an appearance of a reserved, slender, tall man, seemingly too shy to make for an authoritative commander. Throughout the conversation lasting a total of ninety-minutes, Makenga remained rather reticent, offering only short answers to comprehensive and nuanced questions. He is the character opposite of his political pendant, Bertrand Bisimwa, the political chairman of the rebel movement. Speaking to him for more than three hours in Kampala in late February, Bisimwa is the stereotypical spokesperson — a bumblebee of a man, animating and upbeat. Slowly, however, Makenga seemed to warm up to us, offering shy smiles and silent laughter. The laughter seemed out of place, given circumstances and the topics of discussion. He received carefully crafted criticism well, even inviting us to offer our views and interpretations of the situation. The laundry list of allegations — war crimes, the affiliation with International Criminal Court indictee Bosco Ntaganda, exploitation of minerals, the support by Rwanda and Uganda — he dismissed with a feeble but stern smile. At times, he allowed his assistant to elaborate on questions about the forthcoming United Nations intervention brigade and the role of new UN Special Envoy Mary Robinson, former president of Ireland. Unfortunately, the answers were non-conclusive. He vilified the government and boasted that they had captured Bosco, both grieved about the plight of the populace and offered to be a force for good; however, they offered little in the form of a clear-cut political strategy. Makenga seemed much less aggressive than his movement’s official stance. In response to questions on disarmament, security sector reform or land and citizenship issues, Makenga lectured well-rehearsed and well-argued statements. Following the interview, M23 has stepped up its rhetoric against the forthcoming UN intervention brigade, alarmed in the face of a new potential foe of 3,000 troops from South Africa, Tanzania and Malawi. Allegations abound once again that M23 is receiving external support. All the while, talks with the Congolese government have resumed in Kampala — with an open end. However reserved, Sultani Makenga remains the leader of M23, canny and authoritative in his command. Shy but determined, he will continue to force his imprint on the future of his country.